Time: Are You Spending or Investing? Friday is almost in the rear-view mirror. How much time did you spend talking about strategic issues this week? 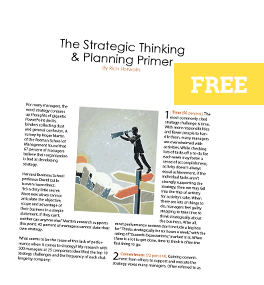 Research published in the Harvard Business Review showed that 85% of executive leadership teams spend less than one hour per month discussing strategy, with 50% spending no time at all. Contrast that with Amazon.com. Amazon’s CEO Jeff Bezos (recently rated the 7th best performing CEO in the world in a study by INSEAD) said that his senior management team spends four hours every Tuesday discussing strategic issues. Not budget. Not tactics. Not operations. Strategy. He expects those strategy discussions to happen throughout the organization. This type of discipline has played an integral role in Bezos’ ability to increase the wealth of Amazon.com’s shareholders by $37 billion over the past 13 years. In fact, while many organizations are continuing to blame the economy for their mediocre performance, Amazon.com just posted record profit and sales (WSJ article: “Amazon’s Profit Soars”). What does your breakdown look like? What other ways have you found helpful in facilitating strategic conversations?